Sep 1 Pump up the jam! As the great Carol Channing would say, “you can wish as you want, you can want as you wish. Still you’d better hear me say; jam tomorrow, jam yesterday, but never, ever jam today.” Well Carol, guess what? We ARE having jam today! Making jam is easy and fun, especially this quick refrigerator jam. The plus side is, it’s much easier than making preserved jam. The down side is, it’s only good for about 4 weeks. But the plus side is it will get eaten before that anyways! 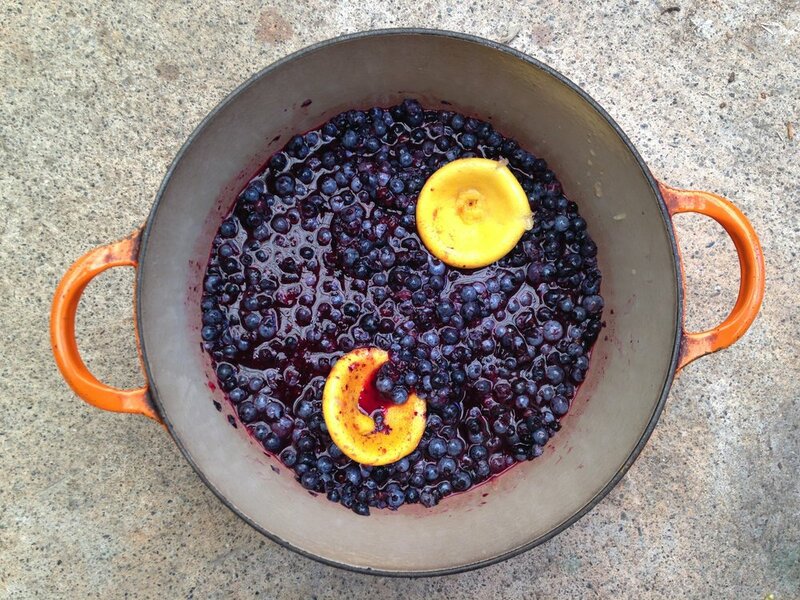 This recipe uses wild Maine blueberries, the official fruit of Maine! Maine produces 25% of all blueberries in North America. These tiny blue beauties are chock full of antioxidants, low in fat, and high in fiber (25% of your DV, 2x regular blubes!) They are also a super source of manganese which is very important for bone development. If you can’t find them fresh, look for them in your frozen aisle! Another benefit to making your own jam is that you can control the amount of sugar that goes in. Many store bough brands have a frighteningly high sugar content that ends up taking over the natural sweetness of the fruit. In addition, blueberries have enough natural pectin so there is no need to add pectin in order to make this jam. Under ripe fruit usually has a higher pectin content than it’s ripe version, so if possible, use half under ripe and half ripe blues for this jam. We also add lemon juice for acid, and throw in the peel. The flavor is killer and the inner part (or the white pith of the lemon) is also rich in pectin. Not having to use pectin means getting a more intense, natural fruit flavor. This jam is perfect for toast, scones, on ice cream, in a cocktail, on a spoon, or as a gift! Maybe you should send one to Carol Channing! Directions: Put 3 spoons in the freezer. In a large, heavy bottom pot, pour in blueberries, sprinkle with 1/2 cup sugar, and squeeze in the juice of a lemon. Reserve lemon for later. Using a potato masher or something similar, mash the blueberries so that about half are mashed and half are still whole. Let sit 10 minutes. Add lemon halves. Bring pot to a medium high heat and get those berries boiling! Once they reach a boil, reduce to medium heat and stir often. Cook about 20 minutes until the mixture has thickened. Once you think it looks done, remove a spoon from the freezer and dip into hot jam. Wait a moment, then run your finger through the center of the spoon. If it creates a path, the jam is done. If not, continue cooking a few more minutes and test again. If it is done, add remaining sugar and mix well. Remove from heat and allow to cool 10 minutes. Transfer to jars and allow it to cool to room temp, uncovered. Then cover and keep jam refrigerated for up to 4 weeks. Eat often and enjoy!